the one thing you never do (or at least i never do) before arriving at a field site is check to make sure i'm not arriving on a public holiday. thursday was the day of the ascension in denmark, a public day of rest followed by the pseudo-holiday that always shows up whenever the possibility of a 4-day weekend arises. a holiday for the field site is a holiday for me too. i spent much of the last 48 hours, both of which featured impeccable weather (warm, bright, clear, dry), taking naps under trees, by the waterfront, and in parks, all of which copenhagen is abundantly provisioned with. late in the day, i took the bike over the bryggebroen that connects vesterbro with the islands brygge, and then along the waterfront path heading in the direction of christianshavn. the city built, some years ago, a public swimming facility here (havnebad), and on a hot summer day the danes come out in force. almost all i heard spoken was danish, which suggests that there were hardly any tourists. why aren't they here? i asked myself (later, when i unwisely cut through part of strøget, the shopping street, to get home, i figured it out: all the tourists are at H&M). the only obviously non-danes i saw were a few asian and eastern european folks with large bags filled with recycling. bottles and cans spent no more than a few minutes in trashcans or on the ground before they were picked up. think paris plages but less hokey, with more blonde people, and fewer empties. there were also many souped-up powerboats. i saw several <12-ft fiberglass craft with 300hp outboards on the back, and the water was filled with the sound of acceleration and boats bouncing on the chop. after that, a peaceful ride through the assorted piers and docks of christianshavn, which revealed numberless vistas of people sitting around cloth-covered picnic tables stocked with lots and lots of wine and real wineglasses. norbert elias notes, in a somewhat different context, that civilisation is indicated by the use of cloth and glass. 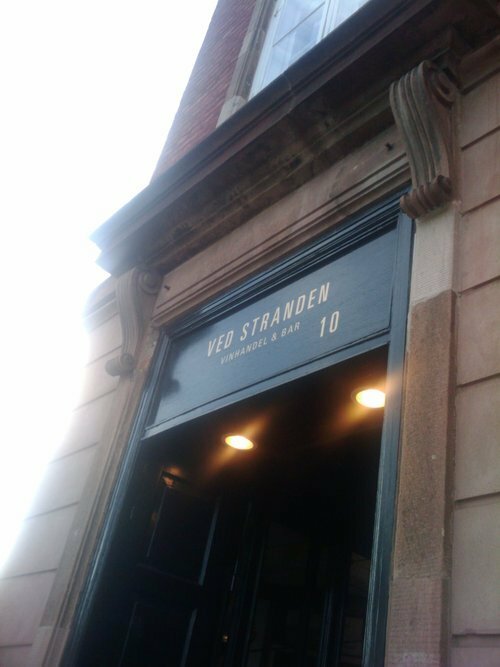 then there is ved stranden 10. at 8pm, the sun still a hand's width above the city roofs, i stopped by to take a look at a shop whose windows were filled with bottles labeled in a style even a relative novice in natural wines, as i am, recognises as being of a type: no bright colours, untraditional, scrawly handwriting often in evidence. inside, carefully selected furniture, lots of copies of monocle and the new yorker, and a long list of wines by the glass that included a vin jaune from the jura, an oxidised yellow wine (i never see this on lists of wine by the glass). all good indications. i got a glass of the vin jaune and went outside to read by the water. when the glass showed up, it came with a few pieces of 2 year old comte that were soft, ripe, sweet, and nutty. the wine was incredibly delicious, perfect for the weather, and complex: rich, mouth-filling, lightly oxidised, plenty of acid, the bite of alcohol, the flavour of all sorts of summer fruit, the odd, unsettling but also comforting aroma of a geueze. i've never had anything like it and it was especially perfect because completely unexpected. upon inquiry, it turned out to be a 2002 vintage from jean-françois ganevat, one of 12 bottles in denmark. it was nice that it took some investigation to figure this out, because ganevat is another of the hero winemakers of the natural wine nerd movement. another beautiful, unassuming* place, like frederiks have. and their coffee program is supervised by the coffee collective. very nice. ** "Only wine we like to drink, either in long-stemmed crystal or in a mustard jar, finds its way into the selection."